*I asked real Mamas to wring their guts on motherhood and their battle with ‘perfection’. Confessions: what makes them feel less than, what they hide, and where they wish they could just be – not treading, not second-guessing, not comparing. The gold in this project lies in their OWN words; heart-poured experience that I’d love to share with you, but I’ve done my best (hint: the meaning here) to share the juices. I’ve been noticing you – looking a bit defeated, hearing your apologies before your greetings, deflecting a genuine compliment like a hot potato because you feel it too tightly tied to your perceived shortcomings. You compare yourself to unrealistic measures – perfection, whatever that madness is – and come up shy all too often. I wish you knew what I see in you. I wish you could see inside me. We’re not all that different – any of us. Don’t apologize for the snack you pulled out for your kid during our play date. I’m not reading the nutrition label to determine your % of total parenting value. There is nothing you could pull out of that snack bag that could make or break our relationship. Now, let’s play. Don’t preempt you choices with an apology or disclaimer. For anything. Ever again. Choices don’t place us in definitive clubs, branding us one way or another. Consult your gut and carry on. There’s a knock at the door and you’re sweating, still coming down from the Hulk-like adrenaline rush of shuffling and hiding your junk, ditching it into spare-room purgatory and behind cupboard doors. You didn’t save face; you were only left distracted and unavailable to the gift of connection. The person visiting you left their damn underwear on their bedroom floor at home and walked over them on their way out the door today, I’m certain of it. A messy house is a sign of life. Either you made play a priority over order and made memories, lived some life outside of your four walls, leaving a trail on your way in and out, took a day off from the schlepping during a long week, or opted for a nap to replenish a depleted self, pushing organization off for another time – ALL acceptable ways of serving your tribe. You found a late homework sheet under the dinner table in company of crumbs, pet hair, and toy trinkets and forgot to sign the reading log this week. The good news is that our children have more opportunity that we have ever known! The bad news is, that comes with multiple logins, and forms, and supplemental reading and math websites, and project fairs, and all sorts of things that whisper you’re falling short if we don’t subscribe. Breathe. We are doing our best. The teachers know it. They are fighting the same workload and resource battle on the backend. Let’s meet at understanding. You bribed you kids into the car this morning with leftover Halloween candy to get to school and work on time. You can’t afford to be late again and the morning was an air-pop popcorn maker plugged in with its lid off. There isn’t a magical window built into each day where lessons can be imparted in a climate & environment controlled bubble. Anyway, you were probably the coolest mom ever – even if just for today. You read an article on marital intimacy and assumed they were quoting annual totals. Turns out it was weekly. Whoops. Love is complicated and unique to each and every mixture of partners/jobs/joy/stressors/tantrums/bills/family/remaining pulse and not a damn thing like the situational portrayals streaming our media – actors and polls. Shut the magazine article and have a conversation about what works for YOU. You fed your tribe breakfast for dinner (ok, cereal or toaster waffles) out of convenience this week. More than once. To your credit, there was fruit involved. Congratulations, you provided them with THE MOST IMPORTANT MEAL OF THE DAY – TWICE IN ONE DAY. Better yet? You didn’t get one complaint. You were simultaneously able to enjoy the win-win meal with your family…while it was still hot…or crunchy. You cooked a meal that didn’t require a recipe and consisted of just a few ingredients. It’s one of those back-pocket meals that you rotate through each week into exhaustion, falling short of the menu boards. Cooking isn’t your thing or maybe you feel too short on time to explore it. Your friend has a three ring binder bursting with recipes she’s tested and approved. Don’t feel inferior! It’s just her thing. Try borrowing one from her and share one of your personal gifts back. Maybe that’s humor or praise. All gifts are equal. You’re torn between buying the organic berries to feed your family right and paying your bills to shelter them. Do your best with what you have and stop peeking at everyone else’s paper! Opportunities for kids today are endless – Bravo! Opportunities for kids today are endless – Crap. You have your children involved in numerous activities. You go from dance to soccer to Spanish to religion. You eat meals on the run and keep condiments in your car. You’re sure it’s good for them to be involved and you want to give them the best foundation you can. You want them to start young so that they’re eligible for opportunities to make special schools or teams in the future, as the times now seem to demand. They’re most often eager to be involved. But there are times you also feel rushed and stretched, over-extended. You wonder what family dinners feel like. You wonder what a lazy evening at home means. You remember running the neighborhood until the sun went down when you were a child. You wonder if you’re giving them enough freedom to be. You keep your schedule loose and light. Over-commitment gives you the hives. You like your free-rangers to explore and use their imagination for entertainment and learning. Your version of sports is a pick-up game at the local park. Maybe you can’t afford the extracurricular activities or camps that your kids’ friends are in, or maybe you don’t subscribe to the intensity. Most often, you are comfortable with your choice, but sometimes you wonder if your kids are getting enough. Everyone else seems to be doing it. Do they feel left out if they aren’t on the team with their friends? If they aren’t on the field 3 times a week will they ever even have the chance to make the team? Are they getting enough from you without the groups and lessons? Will they feel slighted when they’re older and their peers are heavily involved? Good news. They’re all going to be ok. If you child thrives with structured activity: thumbs up. Game on. If they’re lead by free spirited play: turn them loose. If they are meant to be the next sports prodigy, that will work its way out. What if we close our eyes a bit more often and let our gut and our child’s needs guide us rather than trends and pressure in our communities or neighborhoods? You made it through the week – work and activities and life. You scheduled a date night or time away with girlfriends but the guilt is creeping in. Your time together as a family has been limited. Go. Just go. It’s one night in the mix of many and you need your battery charged. Kiss them goodnight. You are teaching your child that the world doesn’t revolve around them. You are teaching them to care for themselves so that they may have permission to do the same one day. Your child peed in the corner at after-school care. Nobody saw it coming and he didn’t much understand what the fuss was all about. Your toddler did the fish flop in the middle of the grocery aisle and you hauled him sicking and screaming over your shoulder through checkout. You’re too far in, there’s no ditching the cart without the diapers! Don’t apologize for your child’s choices or outburst as a reflection of self, insisting, PLEADING that this isn’t typical. That suggests that children are unselfish and peace-filled beings with all the answers in their wisdom-filled three years of life. Or that we are. Neither of which is true. Flash a fellow mama that, it’s okay, we are in the same club, look and offer a hand. Single mama, you often compare yourself to the completeness of ‘traditional’ families. You wonder if you’re enough or just half enough. Magical things happen when you become a single parent – suddenly your capacity to love opens a spare room you didn’t know existed and you become more than one person for your little family. You are enough. You are ABUNDANTLY enough. You are giving them what they need – right now. I don’t come to your house to admire your new countertops or evaluate the decade of your flooring in some rank equation related to human worthiness or friend-ability. That house you sometimes find shame in has sheltered you from the elements. It’s full of life and memories. The scratches and dents remind you of the fleeting bustle of the children and pets you brought home for the first time and the life they lived while in your nest. Money can’t buy happiness. Granite can’t grant wishes. Square footage doesn’t forge friendships. And if your friends are indeed the type who are judging your worth by your countertops or your outfit or where you shop for clothes, than I suggest you skim the fat and dive a bit deeper into the pot. The good stuff usually sits near the bottom. You spotted the put together mom at the store while you were wearing a coat to disguise your pajama sweats and a hat over your second-day hair. You put your head down and plowed that cart away like a contestant on Supermarket Sweep to find refuge in another aisle; safety from your very own self-imposed judgment and scrutiny. Don’t apologize for the way you look or dress your body or tend to your hair. Don’t warn me of your appearance to pad my impression of you. Impressions wade at the surface and friends dive deep. Being comfortable is allowed. Being ‘You’ is encouraged. When did we let that slip away from us, anyway? I don’t hang out with you because you’re polished and I’m certain that’s not why you like me. Catalogs and magazines are fantasies, not reality. Who lives like that anyway? Answer: the paper catalog families. They aren’t even real or related or probably even in the same photo shoot at the same time. They were airbrushed and Photoshopped into the impeccably staged and lifeless living room via the touch pad of a Mac. The models’ real mothers were griping at them the whole way to the photo shoot to keep their hands off their hair and their fingers out of their noses. Career Mama: You work because you support your family’s needs. You have no other option. Maybe you work because the thought of staying at home gives you hives. Maybe you may work because you fully enjoy what you do and your contribution makes a difference – you simply choose it over any alternative. And while your situation appears clear to you, on occasion the guilt sneaks in. You’ve compared your life to others and wonder if you’re present enough. You wonder what it would be like to be your child’s sole care provider. You wonder what it feels like to spend your days side-by-side or watch the bus pull up to the house after school. Maybe you wonder if you’re supposed to want to stay at home when you simply don’t. Our situations and lifestyles vary. We are uniquely made. Our kids know different versions of life and they thrive in a great many. You are teaching them responsibility, work ethic, potential, contribution, balance, passion, community, and love. Stay-at-home Mamas aren’t skipping through a daisy field with steamy, fresh baked cookies all the joy-filled day, just as career Mamas aren’t standing on platforms receiving praise and rewards at work after lunching in silent bliss. Let’s hold hands and round out the circle. You were hiding in your bathroom for JUST ONE MOMENT of peace when you heard toddler footsteps intently seeking you out. You quickly reached for the hair dryer and turned it on high because you knew he was afraid of the noise and bought yourself a few delicious moments in your own head. He’s fine. It’s called an adult time-out. You taught him independence by encouraging self-play. Win-win. You rented a family movie knowing full well that you’d be sneak-sleeping the entire length of the film to catch up on the ten thousand hours you’re backlogged. Your kid looked back and caught you with one eye closed and the other desperately fluttering to stay engaged. You explained to your kids that you work hard to love them right and that taking care of yourself is as important as taking care of them. They felt you and that’s what counted. You stomped out the door and dumped the entire tub of Legos on the back patio when you lost it after having asked 25,001 times for the kids to pick them up. You syllable clapped while shouting, “FOR THE LOVE OF GOD, SHOES ON YOUR DARN FEET!” on the way out the door this morning. You didn’t’ say darn. Something else slipped out and dangled in space for a while. It’s okay. You’re human. Exhaustion is human. It’s going to happen – it’s what we do with it that counts. Take a deep breath. You’ve taught them a valuable lesson in forgiveness – asking and offering. And a word not to say. You approach the door of the pediatric dental office sweating, already anticipating failure and that feeling of scrambling to explain away your role in a cavity or troublesome tooth, which somehow turns into an attempt at validating your ENTIRE PARENTING worth. I believe in most situations we’re doing the best we can. Some people could slather their teeth with caramel before bed and never score a cavity. Brush boldly tomorrow and carry on. My son recently told me I was the “best mom ever.” I wasn’t doing anything special. We were just sitting together quietly. Mothers are human beings RAISING HUMAN BEINGS. That’s a lot of imperfection and moving parts. We’re still figuring it all out. For the rest of time, we’ll be figuring it out. There is no manual for Mama. Uniformity would be so bland and the world needs flavor. Your kids don’t need the Pinterest mom AND the breadwinner mom AND the fashionista mom AND the top chef mom AND the floor player mom. They just need YOU. Who you are right now: an ever-evolving woman living in truth and hope and drawing from your gifts. Giving what you’ve got each day. They don’t need your superficial expectation of the perfect mom, they need you. The sooner we squash the SHOULD BE, the sooner we can shine in our AM. Hands stacked. Let’s all be the World’s Okayest Mom together. Let’s trust in the big patchwork blanket we stitch, each filling a unique and important piece of the display. What we individually gift our children – out of example and mistake is what they will carry forward when sewing their own. My children will expand and inspire yours with the gifts they’ve been given. Yours will expand and inspire mine. Our confessions bring us closer to our truths and that is freedom, baby. 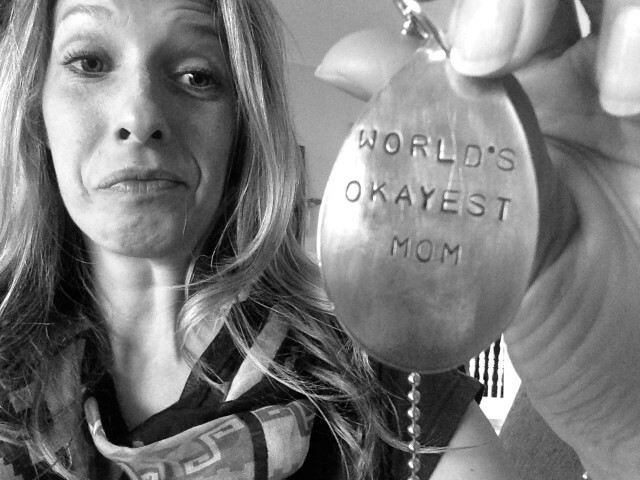 Share this with the World’s Okayest Moms in your life – tell us what makes you gloriously OKAY. Confession: I endlessly rotate a small selection of meals, my home looks like a ransacked art studio in session rather than an organized living space most often, I’m continuously surprised at what I’m comfortable leaving the house looking like, and I’m the mom who sent her son to school in a bright red shirt on blue shirt pep concert day – ooops.